Cdv of Bvt. 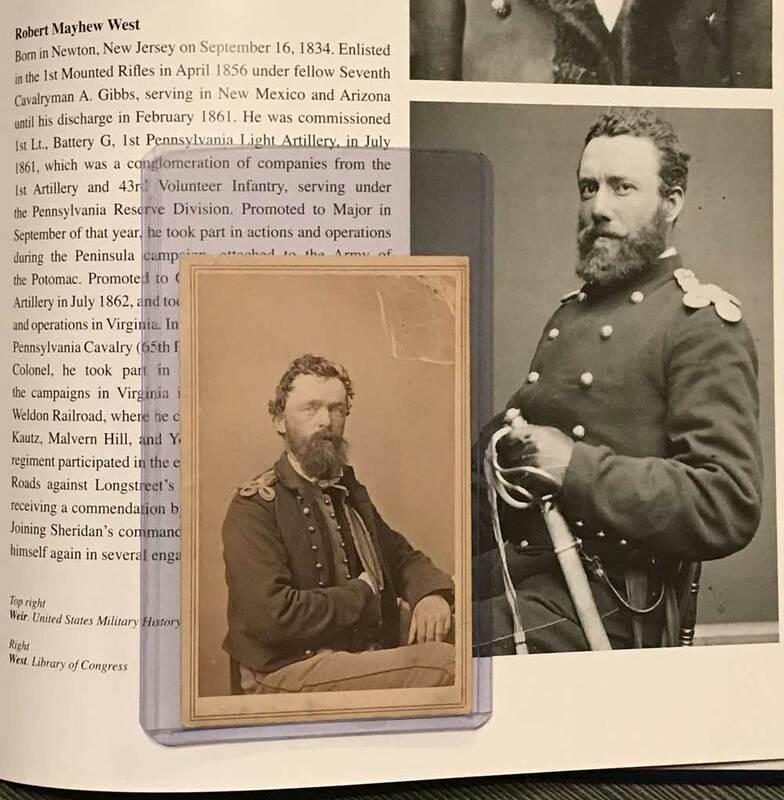 General Robert West, Colonel 1st PA L.A. & 5th PA Cavalry & 7th US Cavalry. No b/m, print of id page will come with the image. Minor "crinkle" in the right corner is actually part of the albumen and NOT a damaged area. Robert Mayhew West himself had an interesting career. He was an engineer before the Civil War; was commissioned Captain, battery G, 1st Pennsylvania, Light Artillery, in April 1861; was promoted to Major 15 Sep 1861, and to Colonel 28 Jul 1862. Transferred as Colonel to the 5th Pennsylvania Cav- alry in April 1864, he remained thenceforth a Cavalry officer, and was made a Brevet Brigadier General later in 1864. He participated in all the action of the Army of the Potomac, and remained in the Army after the War, reverting to the rank of Colonel, and after the armed forces were reduced in size, becoming Captain of the celebrated U.S. 7th Cavalry in the Indian Territory. There was some trouble here, and Captain West was suspended from duty 3 Feb 1868, "for drunkenness" (not unusual at a Western Army Post), and he resigned from service early in 1869. "As a tribute of respect to a most worthy and meritorious ex-officer of the U.S. Army, the Commanding Officer announces the death of Robert M. West, late Captain, 7th U.S. Calvary and Bvt. Brig. Gen. of Volunteers in the late War, who died in the vicinity of Fort Arbuckle, Ind. Terr., on the 3rd inst. 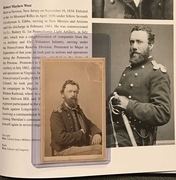 Gen. West served with distincation as Col. of the 1st Pa. Art'y and 5th Pa. Cavalry in the Army of the Potomac, and was breveted Brigadier General of Volunteers on account of his gallantry and meritorious services during the war. With our country we mourn the loss and cherish the memory of the noble dead who proved true and loyal to Our Country's best interests in time of danger. The American Flag will be displayed at half mast from reveille until retreat. Attendence at the funeral at 3 o'clock tommorow is solicited." Resolutions honoring Battle of Washita casualty, Capt. Louis M. Hamilton, passed Dec. 4, 1868, at a meeting of the officers of the Seventh Cavalry, held on the Canadian River in Indian Territory (probably at Camp Supply). George Armstong Custer, who signed the resolutions, presided over the meeting and Robert Mayhew West served as its secretary. Noted are "the respect and estimation in which the deceased was held," and the fact that Hamilton’s grandfather, Alexander Hamilton, had also served his country with honor and devotion. Copies of the resolution were directed to be sent to Hamilton’s relatives, the Army and Navy journal, and the Daily Eagle (Poughkeepsie, N.Y., newspaper).